Remember, a properly licensed hunter has every bit as much right to be in the woods as you. With a little thought and care hiking during hunting season can be a safe experience. As with any season, it is crucial to let someone know where you are going and when you plan to be back. Know your location and the surrounding areas. Know your hunting season dates and locations- remember hunting is year-round. Some states don’t allow hunting on Sundays. Realize that muzzle loader, archery and other non-rifle seasons are going to be much less heavily hunted. Rifle/firearms season is the biggest worry. Don’t fear fowl season. The guns are usually pointing up and those hunters well within range of not mistaking you or Fido as a dove, pheasant, or goose. It’s mostly deer season you need to be concerned about. 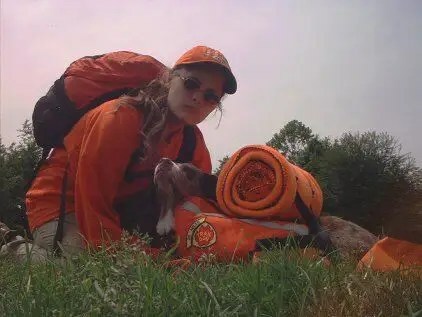 Wear Hunter Safety orange. Lots of it. Probably not as much as I can do (head to toe, most gear), but a hunter’s safety vest is worth the $1-2. Make sure your dog is also wearing some sort of orange. The same style hunter’s vest that you wear will also work on your dog if you can’t find a canine-specific cape. Put his legs through the arm holes, bring the front panels under his belly and pin together on top. Criss-crossing under the belly helps with keeping it in place. Cabela’s and WolfPacks both sell ID capes. Most of the Cabela’s style are made to protect the dog from brush, fences or water while hunting as well. Many mushing outfitters do as well. Bandanas are also good, and it doesn’t hurt to have an orange bandana for signaling any time of the year. Don’t wear brown or white- the bad apples who would mistake you for a deer are only encouraged by these colors. Make noise- sing, talk, crash through the woods. Make sure people know you’re coming through. You can tie a sleigh bell to the dog’s pack as well- this might even be good in bear country the rest of the year. If you see a hunter, call out your location and say hello. Stick to protected lands- if there are parks or forests or even private lands available that do not allow hunting- try those. You’d be safer, but remember sometimes people will hunt there anyway. Sometimes it’s best just to stay home. Open day of firearms season would probably be the day to not venture out. Actually, that whole weekend might not be a bad idea. I don’t hike at all during deer season. Sure, the scenery and temps are nice, but, sometimes, it’s just not worth the hazards. Thanks for checking this out. Safe hiking!